The channel resistance seems to be holding as a ceiling for AUD/CHF so I’m hopping in a short position right here. Take a look! In my previous trade blog post, I was waiting to see how the pair would react to the area of interest around the .7300 major psychological mark and channel resistance. Sellers seem to be defending this level quite well for now, so AUD/CHF might be forced to head back down to the channel support or at least until the swing low at the .7150 minor psychological level. Stochastic is already in the southbound route so Aussie bears are regaining control of price action. I’m setting my sights on the channel support around .7050-.7100 but I’ll be ready to trail my stop to entry once price tests the swing low. I’m keeping a bearish bias on the Aussie because of weak fundamentals in the Land Down Under and in China, its trade BFF. Another batch of reports are due from the Chinese economy this week and more signs of weakening in terms of business and consumer demand could lead to a drop in iron ore and the correlated AUD. Industrial production in China is slated to dip from 6.5% to 6.4% year-over-year in May while fixed asset investment could slow from 8.9% to 8.8% year-to-date. Retail sales could tick higher from 10.7% to 10.8%. Meanwhile, Australia has its jobs report due later in the weak and a slower gain of 9.7K compared to the earlier 37.4K increase is eyed. As for the franc, I’m a bit worried that the upcoming SNB statement could mean more jawboning from head honcho Jordan so I’ll be ready to hop out quickly in case the channel resistance breaks. Short AUD/CHF at market (.7302), stop loss at .7425, profit target at .7075. 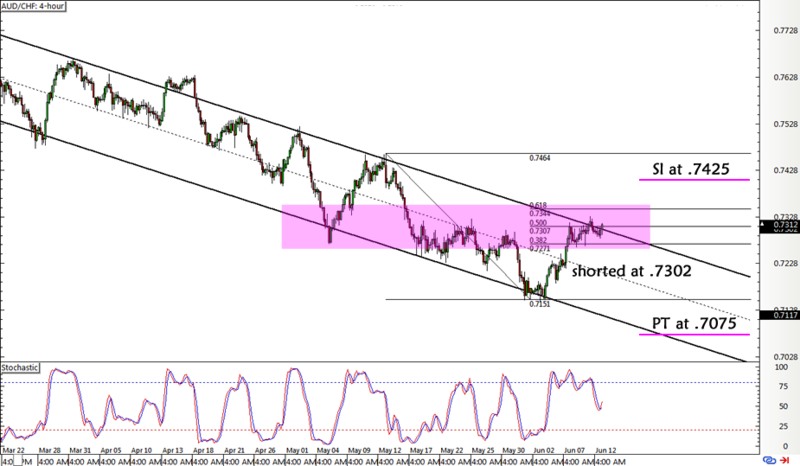 I’ve risked 0.5% of my account on this setup for a potential 1.79-to-1 R:R.
What do you guys think of this short AUD/CHF trend play? Is it just me or does this descending channel pullback setup on AUD/CHF look too good to be true? Think I should hop in soon? So much for that neat channel play! AUD/CHF busted right through resistance so I had to exit early before the pair even hit my stop.